Looking for a stunning flooring option that will serve you well for years to come? Look no further than ceramic tile flooring. Designed to look beautiful in virtually any room, this flooring material is a popular choice for homeowners. Visit our flooring showroom to view the latest products, and begin planning your next remodeling project with us. Our company strives to turn your ideas into reality, while keeping your project costs manageable. A ceramic tile floor is considered a practical investment for homeowners. When you need a flooring option that looks just as good as it performs, ceramic is the way to go. Ceramic is made from clay, which is fired at high temperatures to give it a dense composition. Glazes and finishes give it a non-porous surface. The result is a tough, resilient material that won’t yield to staining or the everyday demands of busy foot traffic. Ceramic tiling is most known for its durability. Its hard surface makes this an ideal option for high-traffic areas like the kitchen, bathroom, or foyer. The density ensures it resists scuffs, scrapes, and bumps with ease, making it a very scratch- and wear-resistant surface. On top of that, ceramic is seen as hygienic and waterproof. Its composition and wide array of glazes impart a spill-resistant surface. This makes it hard for stains to take hold of your flooring. In addition, allergens and dirt cannot be absorbed by this material. Cleanup is also a breeze and helps keep your environment contaminant-free. Simply use your favorite cleaning solution and a damp cloth or mop to keep your ceramic flooring neat and new. Versatility allows tile to be installed virtually anywhere you want. 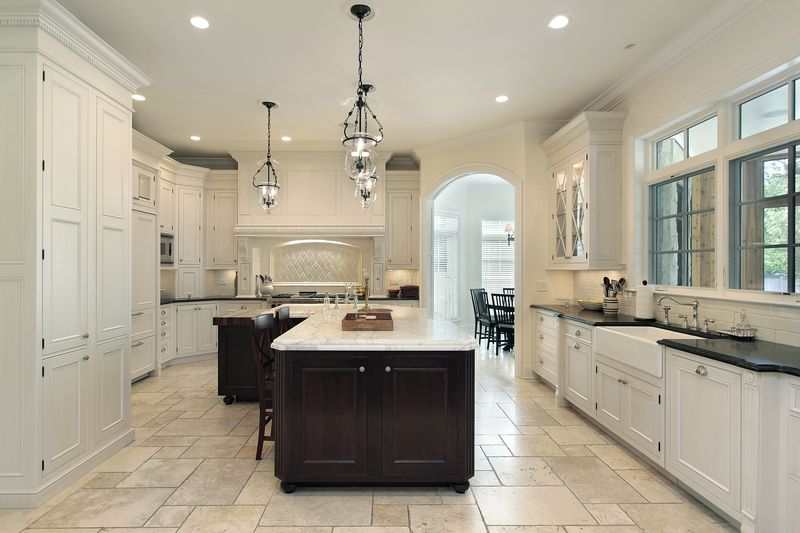 Ceramic floors are right at home in the kitchen and bathroom. Their tough, moisture-resistant surfaces ensure that water doesn’t give mold the chance to grow. In addition, smaller tiles can be placed to adorn the lining of water-prone areas, like the tub and shower. Kitchen backsplashes are also commonly crafted from tiling. Tile also turns patios into great entertainment centers. So whether you are planning to remodel a single room or the entire home, tile flooring has you covered. The ceramic tile floor is well-revered for its durability and staying power. Set the tone and elevate your interior design efforts with it, too. Ceramic is available in tiles of many shapes and different sizes. Along with individual color and design options, it is easy to arrange tiling into distinct designs of your own creation. Define your space with colors and patterns of your own. Tile makes it even easier to turn your interior into a work of art. Are you unsure where to start? Don’t worry, we have you covered. The staff at our showroom is well-trained and knowledgeable in the latest advancements in tile flooring. We’ll guide you through the entire design process so you know exactly what you need to transform your spaces. Our showroom also allows you to preview the latest products so you get great ideas as you speak with us. The strength and lasting beauty of new flooring isn’t just in its composition--it also depends on a well-done installation. When properly placed, ceramic tile serves you well for years. As such, you deserve to work with experienced technicians who are invested in your lasting satisfaction. Count on our ceramic tile floor installation team to realize your design goals. Thanks to our experience and commitment to stay up-to-date with the latest installation methods, you can trust our team to deliver the results you expect. We work hard and install your new flooring according to your exact specifications. As a result, you achieve an interior you can be truly proud of. Contact us today to learn more about the latest releases in ceramic tile flooring. We proudly serve property owners throughout Humble, as well as Kinwood, The Woodlands, Houston, and Huffman, Texas.